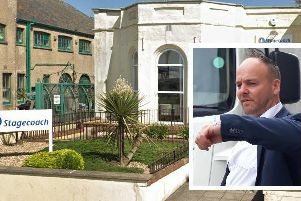 A London drug dealer was caught when police raided a flat in Worthing that was being ‘cuckooed’. Officers found £4,500 worth of heroin and crack cocaine at the address, along with nearly £2,000 in cash, scales and a large hunting knife, a court heard. Drug dealer Mohammed Maow, 24, had been sent from London to Worthing by his employers in order to sell illegal drugs in the town. Two occupants of the house displayed ‘genuine fear’ at what was going on and officers believe they were victims of cuckooing – an often brutal practice where homes of vulnerable people are taken over to sell drugs. He admitted two charges of possessing Class A drugs with intent to supply and was sentenced at Hove Crown Court yesterday. Prosecutor Charlotte Morrish said police raided the flat in the early hours of August 15 last year after they received information that drug dealing was going on at the flat. Officers found 30 wraps of heroin and 22.6g more of the drug in blue packaging, waiting to be broken up for sale. Also found were 31 wraps of crack cocaine and 11.5g of the drug waiting to be split and bagged up, the prosecutor said. Police also found £1,972.80 in cash in the bag, along with cling film, scales and Stanley knife blades. The prosecutor added: “Police suspected that the two people in the bedroom were victims of cuckooing. Miss Morrish said Maow was playing a ‘significant role’ in the drugs supply and was ‘clearly motivated by financial advantage’. Defence barrister Christina Josephides said: “The real problem that Mr Maow faces and has done in terms of his offending history is quite bad alcohol related issues. She told the court Maow ‘strongly denies’ being involved in cuckooing, to which Judge Christine Henson QC said: “He was sent to a flat which he had no connection to where other people lived who were drug users.